Reader question: "We are hoping to buy a house in the near future. A friend of ours who is a real estate agent said we should get pre-approved for a mortgage loan. I've started researching this, and now I'm even more confused than I was before. What does the pre-approval process involve? How is it different from pre-qualification?" You're not alone in wondering this. Last month, more than 4,000 people reached our website by doing Google searches for "pre-approved" and "pre-approval" phrases. It's also one of the most common questions we receive from readers, via email. How do I get pre-approved for a home loan? Can I do this process online? How does a pre-approval letter help me? Is it free, or do I have to pay an application fee? I'll answer each of these questions in detail later on. But first, I want to give you a basic definition. Pre-approval is when a mortgage lender reviews your credit and financial situation to determine how much they are willing to lend you. Normally, you would do this before shopping for a home. The idea is to get a rough idea what you can afford, and then shop within those parameters. Later, after you've made an offer to buy a house, you would go back to the same lender for final approval. This is usually how it works, anyway. The pre-approval process will actually determine two things. First, the lender will determine if you're even qualified for a home loan. You must meet their minimum criteria for credit score, debt ratios, income, etc. 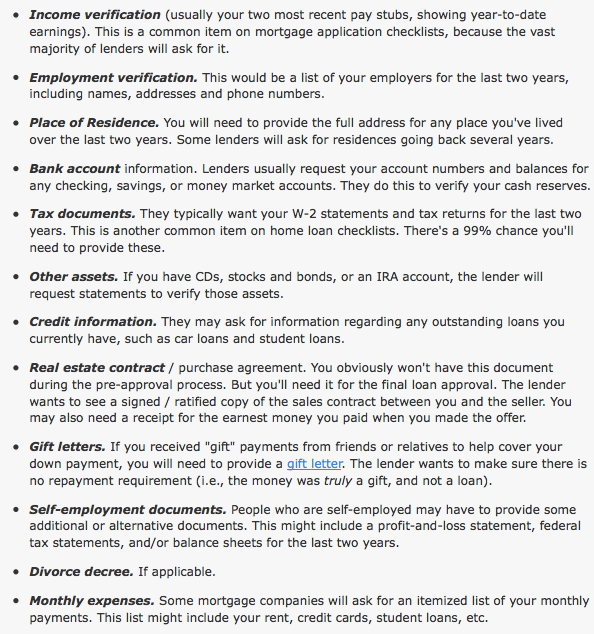 If you meet these requirements, the lender will give you a maximum loan amount. They will also give you a pre-approval letter to use during the house-hunting process. We'll talk more about this letter a bit later. Note: Getting pre-approved for a mortgage loan is not a guarantee. It does not obligate the lender in any way. You'll face a secondary review process later on, in order to get your final approval. There's a lot more underwriting involved with the final approval. Most lenders have some version of this disclaimer on their websites. Being pre-approved for a home loan doesn't guarantee you'll get the loan. In order to get a final approval from the lender, you'll have to go through the full underwriting process. And that doesn't happen until you've made an offer to buy a home. At that point, you would give your lender a copy of the purchase agreement so they could evaluate you and the property. Pre-approval -- This is a more in-depth (and more useful) version of pre-qualification. When you get pre-approved for a mortgage loan, the lender will actually start to verify your financial background. This is what sets it apart from pre-qualification. They will request a variety of documents from you, such as tax records and bank statements. They will also check your credit score. The pre-approval process gives you a more accurate idea of how much you can borrow. That's why I recommend it so strongly. Approval -- This is the final approval by the lender. It takes place after you have chosen a home and made an offer. In order to reach this stage, you would need to give your mortgage company a copy of the purchase agreement. You'll also go through an extensive underwriting process that could take up to 30 days. The lender will probably require a home appraisal as well. "So what's the point of pre-approval," you might ask. What purpose does it serve, it it's not a commitment or guarantee from the lender? Good question. You'll find the answer below. In my opinion, every home buyer should get pre-approved for a loan (unless you're paying cash for the house). It only makes sense when you think about it. You could spend days or weeks looking at houses in a certain price range, only to find out that you're qualified for a lesser amount. What a waste of time. But when you start with the pre-approval, you'll have a pretty good idea what you can afford -- or what the lender says you can afford, anyway. Real estate agents will be more willing to work with you. If you were an agent, would you spend hours out of your day to help someone who hadn't spoken to a lender yet? I wouldn't. This is why most agents will only work with buyers who have a pre-approval letter. Sellers will take you seriously. Put yourself in the seller's shoes for a moment. Imagine you get two offers from potential buyers. One has been pre-approved already and has a lender lined up. The other buyer hasn't even spoken to a mortgage lender yet. If the offers were for the same amount, which one would you take? It's sort of a no-brainer. This is especially important in an active market, where multiple offers are a reality. It also helps you narrow the field when house hunting. Once you know how much the lender is willing to offer, you can shop within that price range. This is the sensible approach to house hunting. As you can see, this process helps you in several ways. No, it's not a commitment from the lender. You can't get that until you've actually found a house. But it's the next best thing. It gives you a pretty good idea what they'll be willing to lend you, when the time comes. So you can shop accordingly. 1. How Do I Get Pre-Approved for a Home Loan? Your first step is finding a mortgage lender or broker. Do you know someone who has purchased a home recently? If so, ask them what lender they used (and if they would recommend them). If you have an existing relationship with a bank, you could start there as well. The same goes for a credit union. If you use a mortgage broker, you'll probably have access to a handful of lenders the broker works with. There's certainly an advantage to this. Once you've chosen one or more lenders, you're ready to submit a pre-approval application. You can start the process online or by visiting the lender's office. You would fill out an application with details about the type of loan you seek, your income, etc. The lender will check your credit score as well. After their initial review, they will tell you how much they are willing to lend you. Tip  Most mortgage companies have an online pre-approval form on their websites. You'll find an online application on the Bank of America website, the Wells Fargo website, and the websites of almost every state and local lender. This is a quick and easy way to get the ball rolling. 2. What Documents Do I Need? Your lender will give you a complete list of the documents they need, at the time you submit an application. They might even have this list published on their website somewhere. 3. Can I Start This Process Online? Yes, you can submit an application for mortgage pre-approval online. But you will probably have to follow it up by sending your financial documents. Lenders use the online process just to get the ball rolling. It's a good lead-generation tool for them, and it's convenient for you. Once you fill out the form and click the "submit" button, you'll probably hear from a loan officer or broker within a few hours. They will follow up by phone or email to request additional information. But it's a good way to get the ball rolling. So go for it. 4. Why Do I Need a Mortgage Pre-Approval Letter? Earlier, we talked about the benefits of being pre-approved for a loan. Real estate agents will be more willing to work with you, and sellers will be more inclined to take your offer seriously. You can actually include a copy of your pre-approval letter with your purchase offer. This is a good practice, because it shows the seller you can likely afford the amount you're offering. This letter tells people you've been scrutinized by a mortgage lender, and you've met their basic guidelines for approval. In other words, you're a serious buyer! Put yourself back in the seller's shoes for a moment. Wouldn't you want buyers to have a letter like this? 5. Is it Free, or Do I Have to Pay an Application Fee? This will depend on the lender. Sometimes, they will waive the application fee as an enticement to bring in more borrowers (i.e., marketing strategy). In other cases the application fee will be rolled into your closing costs, which you must pay when you close on the loan. You should ask about this before you submit your application. If there is a fee, find out if it's refundable. Some mortgage lenders will charge a non-refundable fee for their pre-approval services. They collect this fee when you submit your application paperwork. On average, application fees cost between $300 and $400. Non-refundable means you don't get the money back, if you end up walking away. Other lenders offer free mortgage pre-approval in order to gain your trust (and your business). Can I be denied for a loan after pre-approval? I've thrown a lot of information at you with this article. So let's summarize some of the key points. Mortgage pre-approval is a process in which the lender reviews your financial background (credit score, income, debts, etc.). They do this to find out whether or not you're qualified for a loan. They'll also tell you how much they are willing to lend you. Getting pre-approved for a home loan benefits you in several ways. First, it helps you find a real estate agent. Most agents will only work with buyers who have been "vetted" by a lender -- and who can blame them? This process also helps you identity any financial problems that need to be fixed. If your credit score is too low, or you have too much debt, you'll find out about it during pre-approval. Last but not least, sellers will be more inclined to accept your offer. If you would like to learn more about the lending process, be sure to use the search tool at the top of the website. You'll find a lot more articles like this one. Good luck buying a home!